Zassenhaus began in 1867 as an export store supplying small steel goods and hand tools. Then in 1904, the foundation for the future success was laid with the introduction of pepper mills. Zassenhaus is the leading manufacturer of manual coffee mills. 150 years of experience in grinding the coffee bean just right resulted in the perfect mill. The conical burr grinder is made of high grade hardened carbon steel to provide years of service. The delicate aroma of every bean is preserved thanks to no heat build-up during the grinding process. Infinite adjustment guarantees a consistent and uniform grind from coarse to super fine. 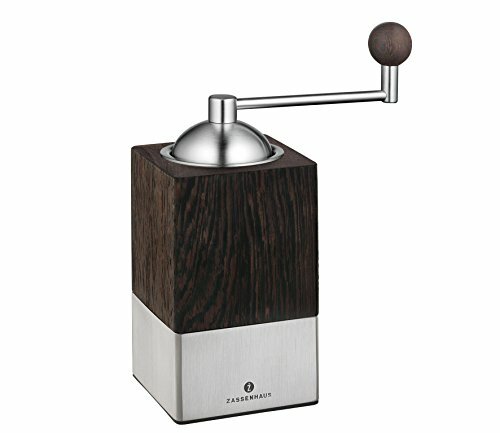 This Guatemala coffee mill is made of Wenge wood and stainless steel. Made in Romania. Measures 3.5" x 3.5" x 7.5". Wipe clean with soft cloth. If you have any questions about this product by Zassenhaus, contact us by completing and submitting the form below. If you are looking for a specif part number, please include it with your message.